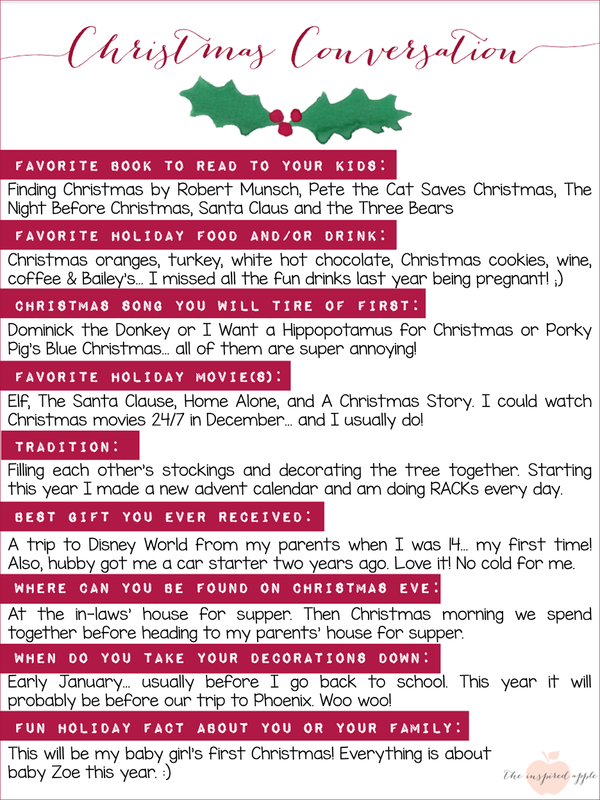 I'm linking up with Abby over at The Inspired Apple for her cute Christmas Conversation linky party. Click the picture below to go link up yourself! Why are oranges SO MUCH BETTER at Christmas?! And, I totally forgot about Porky Pig's Blue Christmas…UGH! Merry Christmas, Amanda!!!! I didn't know Robert Munsch had a Christmas book! I will have to look for that. Coffee and Baileys is always yummy! Congrats on your baby girl--I am sure this xmas will be extra special! Happy first Christmas to your baby girl! Also, I TOTALLY agree about Dominick the Donkey!!! Last year was the first time I had ever heard that song, and I didn't even make it through the song once before it was driving me nuts! No thank you.